Forget about your woolly hats and scarves for a moment and launch yourselves into Best Coast’s world of sun, beach, babes and lazy bums. Within seconds of hearing their patent surfer drones and electric guitars there is no doubt in our minds that Los Angeles based Bethany Cosentino (vocals, guitar) formerly of Pocahaunted and Bobb Bruno (lead guitar) are groundbreaking geniuses for reviving the surf pop genre. Described as indie rock, lo-fi, surf pop music (a genre that became very popular in the 1960s in California). We can definitely hear similarities in style akin to the renowned Sufaris Wipe Out and Beach Boys pinnacle Surfin’ USA. Surf pop bands of the 60s sang about surfing, cars and girls. 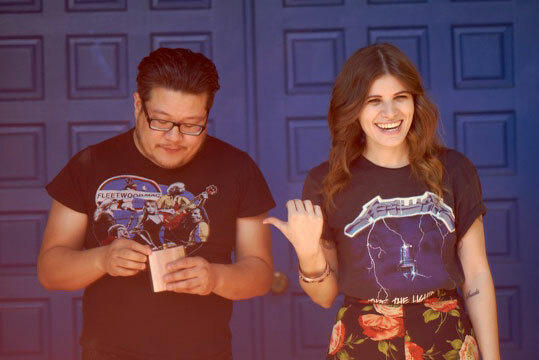 Comparable, Best Coast claim that their music is “inspired by love, life and everything else”: though their lyrics centre on sun, babes, beaches and the laziness of life. Here’s their latest video release from their second album The Only Place (2012) featuring the song Do You Love Me Like You Used To. Keep free from stress with this carefree indie surfer band playing on your pre-Christmas day playlist. Best Coast albums can be purchased on Amazon (makes a great and inexpensive Christmas present too! ).